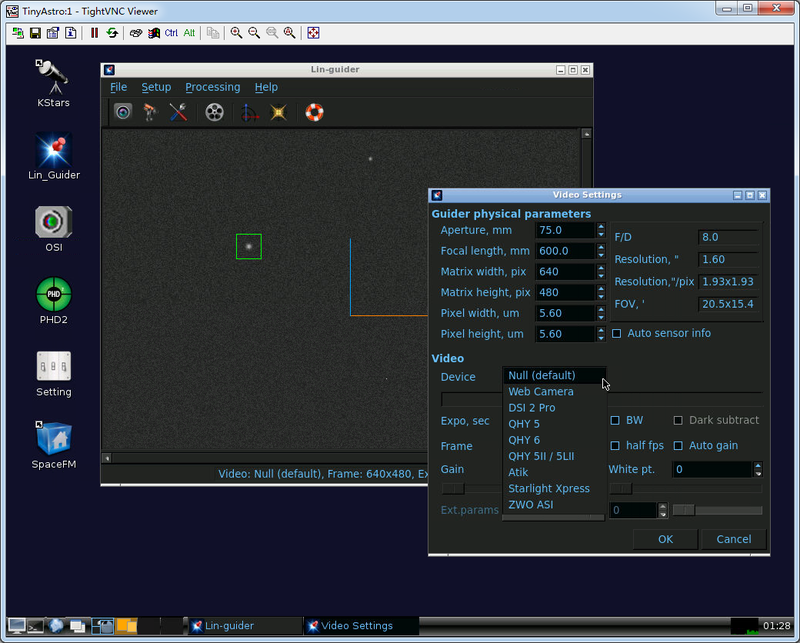 TinyAstro is an ARM Linux system with Kstars and INDI installed. more and more device supported. With your mobile phone or tablet, you can control your gears without a computer. Thanks knro for the great work on Kstars and INDI to make this happen. What is the difference between this and iAstroHub? Would you consider adding support for Raspberry Pi2 I have met you in PHD group and you have helped me a lot on QHY5L II M phd2. 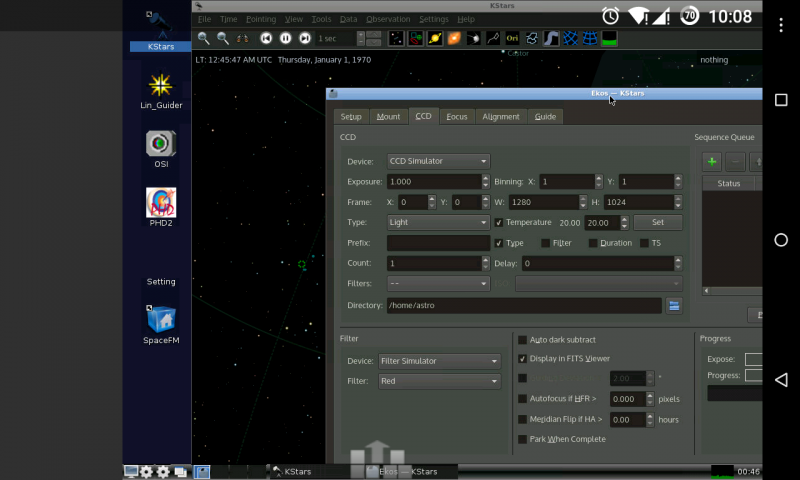 Besides PHD2, I have installed Lin guider, OpenSkyImager, Oacapture and Kstars with INDI server supporting QHY5L II M on Pi2 so that your great project "TinyAsto" would be possible running on it. Thank you for your contribution! Edited by sampson, 26 June 2015 - 11:52 PM. Sorry for the late reply. It will support Raspberry Pi 2 soon. I'm working on it. And phd2 with QHY5L II M support work ok ? From my test, QHY driver gave so many error when capture image. Edited by Max Chen, 06 July 2015 - 11:28 PM. PHD2, TinyAstro will support a large rang of hardware. Thank you knro for the great work on Kstars and INDI to make this happen. Edited by Max Chen, 26 July 2015 - 09:28 AM. 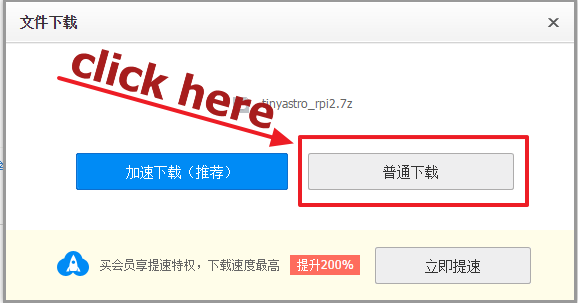 I am so happy to know that you have developed TinyAstro for Raspberry Pi2 and thank you for your reply. However, I haven't made a field test on PHD2 since I want to learn the Lin guider first. Anyway, your TinyAstro is so great that I would definitely try and use it. But the weather in HK is too bad now and I don't think it could allow me to have astrophoto with TinyAstro. Edited by sampson, 10 August 2015 - 01:10 PM. hope you have a great night under the clear sky. Edited by Max Chen, 11 August 2015 - 08:35 PM. I have installed TinyAstro on my Pi2 but it seemed that the "setting" function for changing SSID and Pass doesn't work though I found that the new SSID was store on "ap.config". I tried to change the display resolution by editing the config.txt under "boot" folder but it doesn't work. Could I change the VNC display resolution that on my Android device such as Nexus 7. It is strange that Kstars on TinyAstro doesn't support my Nikon D5300 and D600 but both cameras were supported by Kstars-bleeding that was installed on RaspEX by myself. 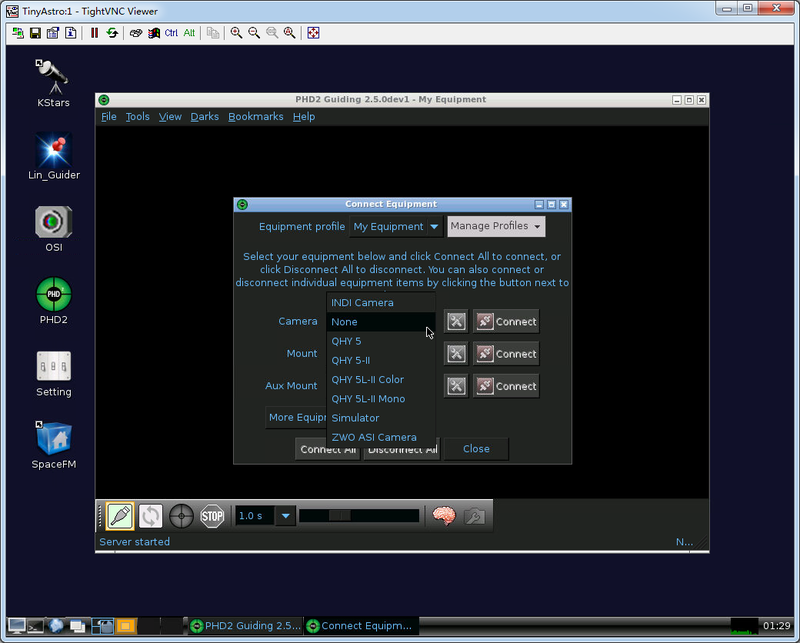 I have also checked that gphoto2 support my cameras. 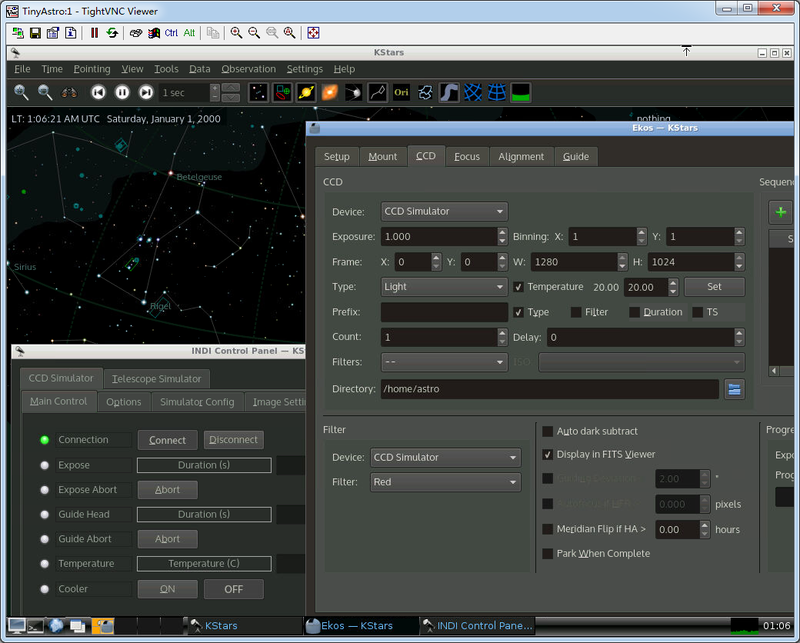 It would not be possible for me to control my DSLR, autoguiding with dithering and plate solving if the Kstars doesn't support my cameras. I install kstars-bleeding directly from PPA and the recent change of INDI cause the problem, and the error log you got is something like "please select a format" ? 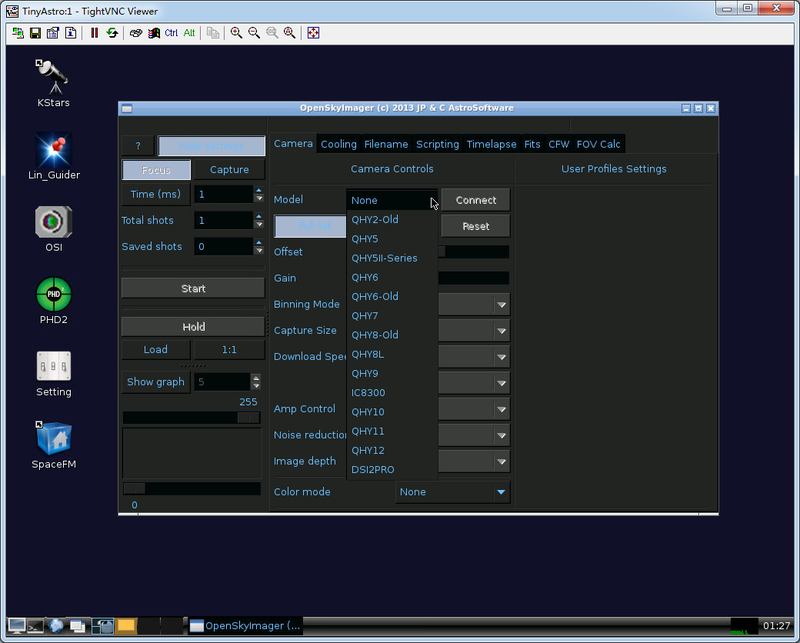 I am testing the new version 0.8, and the image will be release in next week. I'll update the download link here. Edited by Max Chen, 21 December 2015 - 01:01 AM. After updating the rootfs to ubuntu 15.10, the old script for PRI2 did not work any more, I need some time to make it work. Can you upload the old version of the RPi2 build? It is no longer on your website. That would help anyone who is trying to use TinyAstro while you get the script updated (as I am). I'm working on the new image, and almost there, hope I can upload it next week. Can Rpi2 image run on Rpi3? Current RPi2 image may not work on RPi3, I don't have RPi3 to test. I'm considering support RPi3 in the next release. I tried to test image for RPi2 on RPi3. It was very speedy and wonderful. Of course, wifi function on RPi3 board could not be used. So as i needed to use wifi dongle of nl80211 base, i changed some configurations. I am looking forward to your next update. You can follow these steps to use the internal wifi chip in an AP mode. But i am sorry that it is not enough imformation for me. Because the current tinyastro image for RPi2 does not support RPi3, no wlan0 is created without wifi dongle. Glad to hear that RPi2 image can work on RPi3. I'v order a RPi3, hope I can make TinyAstro fully support RPi3 later. Now, TinyAstro support RPi2 and RPi3. On RPi3, TinyAstro use the on board wifi to be the access point, don't need the usb wifi anymore. I tried your latest image on the RPi3. But I was very sorry that phd2 couldn't execute. That error message is here.